These three important sites, located near Tuscon Az, now saved by the Conservancy will help preserve the evidence of the gardens and farming practices of the Hohokam. The Conservancy’s Tuscon Arizona preserves are especially significant in light of the notorious destruction of Hokokam site. An additional 17 acres containing more than a 100 trincheras features associated with the Los Morteros Site was donated by Kenneth and Deborah Ryan and James and Jacquelynn Yeager. They lie immediately adjacent to another 36 acres of trincheras above the Los Morteros community donated to the Conservancy in 1986 by developer Gary Lovelace. Los Morteros, or “the mortars”, is a large Colonial-Classic period Hohokam community, dating between A.D. 500 to 1450. Features at the site include an intact ballcourt, an irrigation canal system, numerous other intact features and trincheras. Trincheras are enigmatic structures of dry-laid rock alignments located on volcanic hillsides above Hohokam villages throughout southern Arizona and northern Mexico. Researchers studying the trincheras as Los Morteros have identified more than 200 of the features above the site. The construction and use of the trincheras appears to have been largely confined to the Early Classic period between A.D. 1100 and 1300. Some trincheras appear to have functioned as water control devices, channeling run-off water into agricultural areas. Other have flat-soil areas behind them, which would have allowed for their use as agricultural terraces. But trincheras might have had several uses for the Hohokam; additional uses hypothesized by research have also included habitation, defense, and ceremonial. In 1997 The Conservancy, Pima County, the town of Marana, and the University entered in discussion about the possibility of creating a public park around Los Morteros and its adjacent trincheras features. 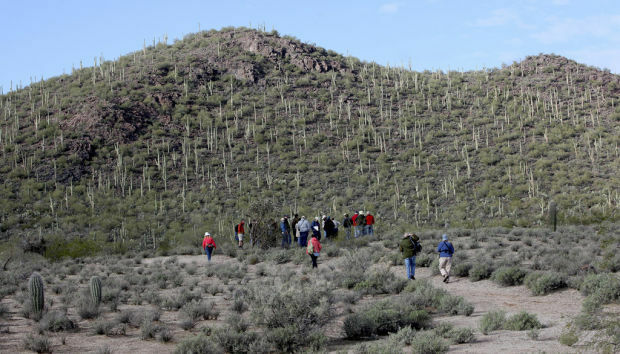 Now, the site and area are a 120 acre Pima County natural and cultural resources park, which is located near the north end of the Tucson Mountains. The smallest of the preserves is a two-acre plot, located in the Cortaro Ranch subdivision, donated by Norman and Francis McClelland. The preserve is part of the Dairy site that originally covered 45 acres. Ancient residents of this site once farmed the rich deposits of the alluvial fans near the Santa Cruz River. A portion of the site exposed in the 1960’s revealed seven to ten feet of stratified deposits, spanning periods from A.D. 300 to 950. Of great interest to researchers is evidence of features from the Hohokam Pioneer period around A.D. 500-800 , as site dating to that period are rare. Pima county was one of the fastest growing counties in 1997, and with these preserves the county made important strides toward preserving its cultural patrimony.